This is a good technique I came across. If you have a large pan, you can work with separate ingredients cocooned in their own little zones. 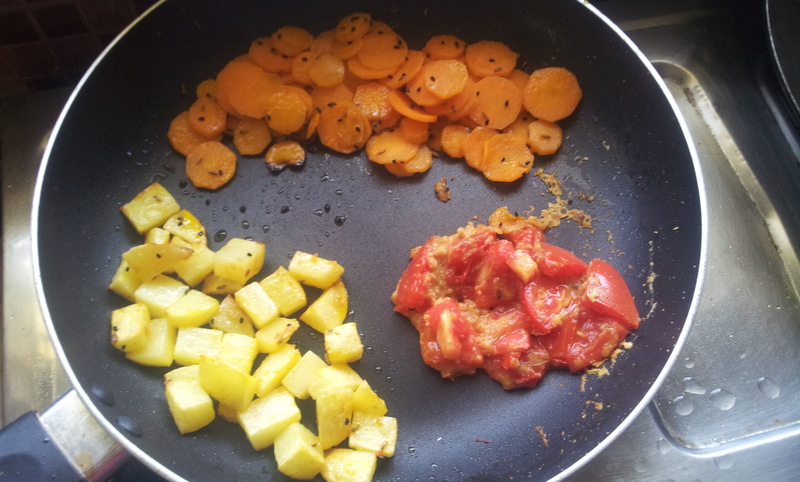 In the picture above, the potato takes the longest time to cook, so it was placed first, once it was time for the carrots, the diced potato was collected in one of the corners (I speak as if a circular cross section has a corner!). It’s the same with the ginger-tomato fry that was exposed to the heat afterwards. The hack can be taken to newer heights using one last nifty little technique. The pan can be repositioned to expose one of the ingredients to direct heat of the oven burner. In the above case that would be the potato. This will ensure differential cooking heat for different ingredients.